The first step is to select a dinner time. 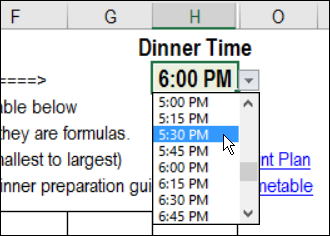 Go to the DinnerPlan sheet, and select a time from the drop down list in cell H2. 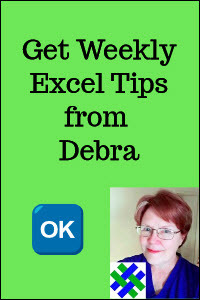 The drop down list was created with Data Validation, and the times are in a table on the Lists sheet. There are meal items, time, cooking locations, and process lists, on the Lists sheet. You can add more items, if you need to. 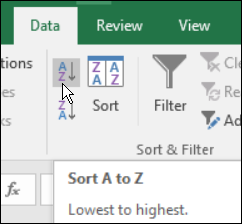 The lists are in named Excel tables, so they will expand automatically. Click in the blank cell below the last item in that list. Type the new item, and press Enter. Next, go to the DinnerPlan sheet, where you will enter all the preparation steps for each food that you'll serve, with the time required for each step. You'll enter items in the green cells (instructions below). There are hidden columns (I:N) that contain formulas. For each food item that is on your menu, enter all the preparation activities on the DinnerPlan sheet. 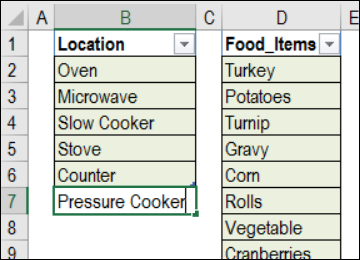 Type in the green cells only-- the grey cells have formulas..
For example, there are 5 preparation steps for the Turkey -- prepare stuffing, stuff the turkey, cook the turkey, let the turkey stand a few minutes after cooking, and finally, carve the turkey. It doesn't matter what order you enter the food items, because the list will be sorted later. Click in cell C9, click the drop down arrow, and select Turkey. Press Tab, and in the Activity column, type Prepare Stuffing. Press Tab, and in the Minutes column, type the estimated number of minutes that step will take -- 30 minutes in this example. NOTE: For longer tasks, you can type the number of hours instead, such as 4.25 hours to cook the turkey. Move down to the next row, and repeat those steps, to enter the other 4 preparation steps for the turkey, and the other meal items. After all the preparation activities have been entered, follow these steps to sort the timetable. Sort the list, from smallest to largest. TimeTable -- a Gantt chart with the schedule in visual form. 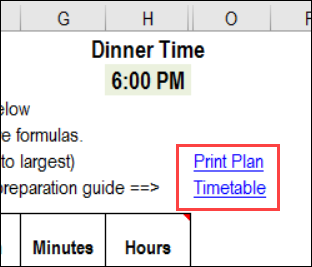 To go to either printout sheet, click the link in column O of the DinnerPlan sheet. Here is the printed timeline, showing when the preparation has to get started, and all the steps for getting the meal ready. Here is the dinner preparation schedule in a Gantt chart timeline. 1. Basic Planner: Download a copy of the free Excel Holiday Dinner Planner. The zipped file is in xlsx format, and does not contain any macros. 2. With Recipe Finder: Download a copy of the free Excel Holiday Dinner Planner and Recipe Finder. The zipped file is in xlsmx format, and contains macros and connections for the recipe finder. 3. 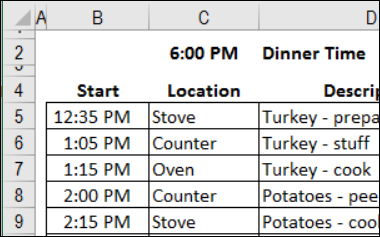 Excel 2003: Download a copy of the free Excel Holiday Dinner Planner and Recipe Finder for Excel 2003. The zipped file is in xls format, and contains macros and connections for the recipe finder.